Clinical introduction A 50-year-old hypertensive smoker presented with a typical angina of 2 days duration. An urgent ECG revealed extensive anterior wall myocardial infarction. In view of the delayed presentation, the patient was conservatively managed with heparin. In-hospital echocardiogram showed akinesia of entire left anterior descending artery (LAD) territory with severe left ventricular (LV) dysfunction. He was discharged with a plan for early coronary intervention. However, he presented a fortnight later with acute pulmonary oedema. General appraisal revealed a restless individual who was dyspnoeic and diaphoretic at rest. On clinical examination, the patient was in hypotension with features of biventricular failure. A 12-lead ECG showed QS pattern with persistent ST segment elevation in precordial leads. The chest radiograph demonstrated features of pulmonary oedema, cardiomegaly and bilateral pleural effusion. Creatine Phosphokinase-MB (CPK-MB) was negative. A preliminary transthoracic echocardiography was done (figure 1 and see online supplementary video 1). 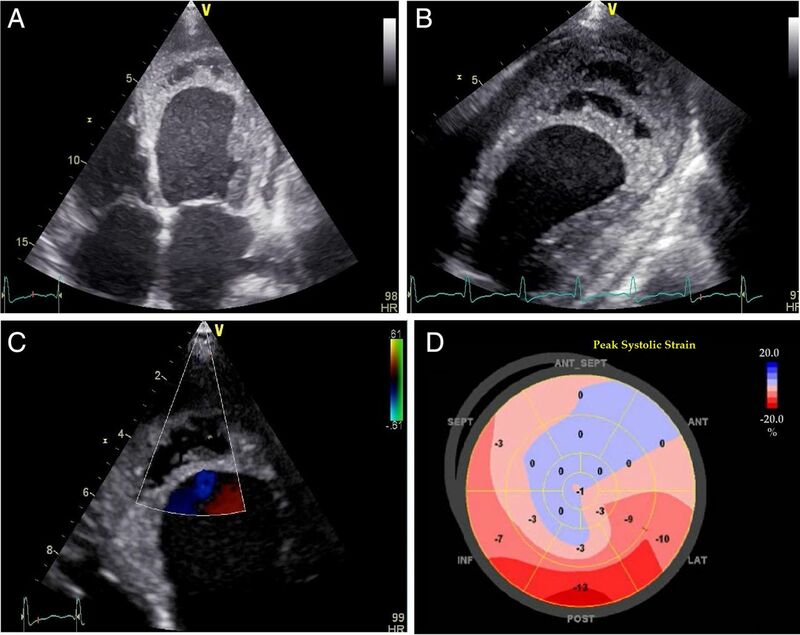 (A) Trans thoracic echocardiogram-apical 4 chamber view; (B) zoomed view of apex; (C) colour Doppler at left ventricular (LV) apex and (D) bulls-eye plot of strain imaging. Question What is the most likely diagnosis based on the echocardiogram?